Any time there’s a gap between receiving a payment, and the payment actually making its way into your bank account (for instance, when you deposit a check on Friday, and it doesn’t post until Monday) the payment should be accounted for as Money in Transit. As with anything accounting-related, the more accurately something is recorded, the better! Let’s say a client pays you by check on the last day of March. By the time the check clears and posts to your bank statement it will be April, leaving you with a bit of a conundrum: If you use the April transaction date to mark the transaction as paid, then your March reporting will not reflect the invoice payment, leaving your Accounts Receivable balance inaccurate. But if you record the invoice as paid in March, then your March bank statement will not reconcile. This is where Money in Transit comes in: when the check arrives, you record it in a Money in Transit holding account – a sort of ‘pretend’ bank account. And when the check clears, you record a transfer from Money in Transit, to your Bank account. Go to Accounting > Chart of Accounts and click Add a New Account. 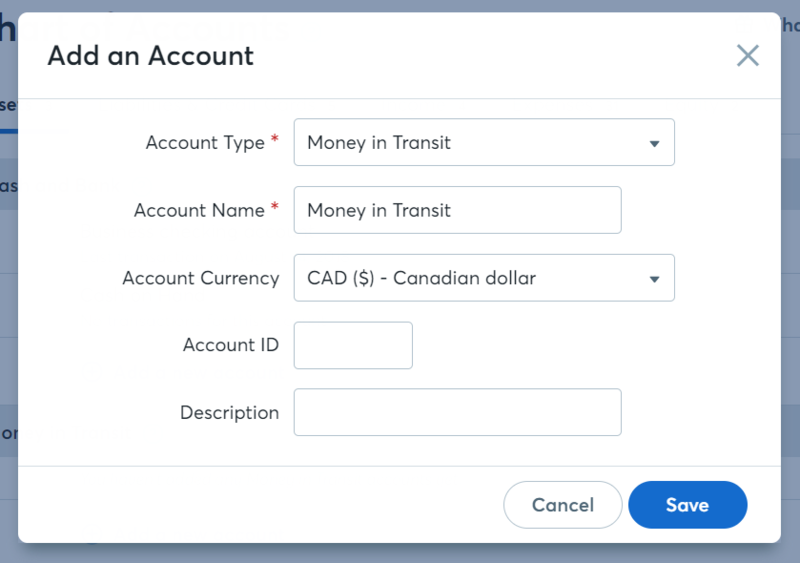 Select Money in Transit under the Asset tab, and give the account a name like Check Clearing, or simply Money in Transit. 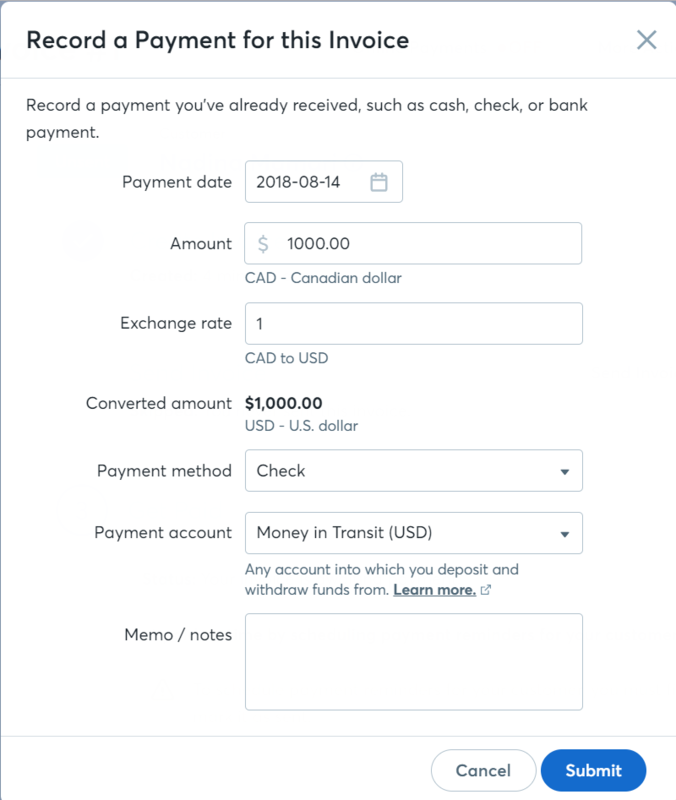 When you receive the check, apply the payment directly to the invoice in the Invoices page, and select your Money in Transit account as the payment account. When the cleared deposit transaction imports from your bank, categorize it to Transfer from Bank, Credit Card, or Loan and select your Money in Transit account from the dropdown menu. This will leave you with three transactions: The originial payment recorded to Money in Transit, the imported transaction from your bank, and a Wave-created transaction called Created Transfer to record the funds moving between accounts. Go to Accounting > Chart of Accounts and click Add a New Account. In the Asset tab, select Bank & Cash and click Other Bank Account. Give the account a name like Check clearing, or simply Money in Transit and click Save. Check the box to the left of the imported payment transaction as well as the expense transaction that you just created And click Transfer at the top of the page. This will show that the payment amount was transferred from your Money in Transit account to your bank account where it now lives. You're done! Now your books will accurately reflect the payment timeline and reconcile exactly with what appears on your bank statement!